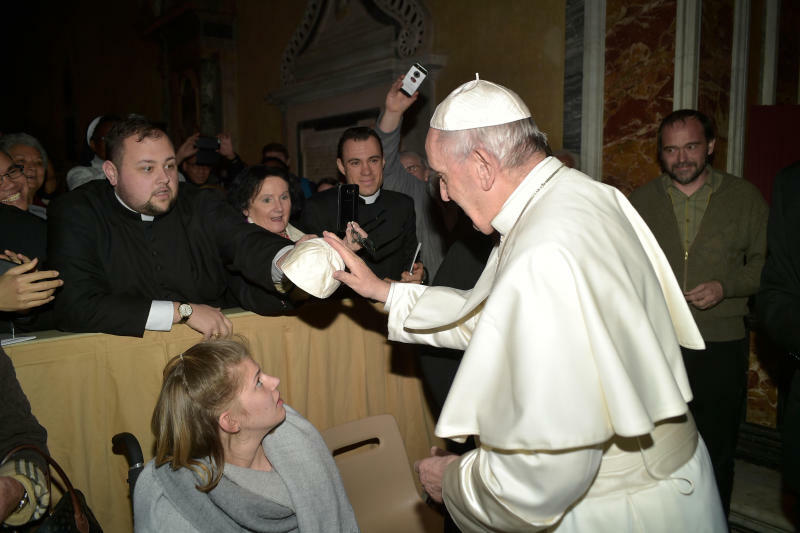 Seminarian John Hepinger's unforgettable moment with Pope Francis. ROME — While his classmates might have playfully teased him a bit for having purchased a zucchetto — the white skull cap worn by popes — they’re not laughing anymore. The cap created a dramatic and inspiring moment for seminarian John Hepinger, who is studying to become a priest for the Diocese of Erie at St. Vincent Seminary in Latrobe, Pa. Many people planning to see the pope first make a stop at Gammarelli’s, the iconic shop in Rome famous for creating ecclesiastical garments — including those the pope wears. On rare occasions, popes have been known to accept a zucchetto held out to them, exchanging it for the one on their head. While John didn’t quite make an exchange with the Holy Father, he came close. It happened at the papal Mass on Ash Wednesday in St. Peter’s Basilica. John says being in the presence of the pope was electric. When John returned to his classmates, they were excited to report they’d had a chance to meet Bishop Robert Barron, auxiliary bishop of Los Angeles. John plans to have a pillow made for the zucchetto, so he can keep it on display in a glass box. “It’s a beautiful testament to our faith,” he says. “I knew Pope Francis prayed for me in that moment. Even now, seeing the zucchetto in the box on my shelf is a daily reminder to pray for him and the church. John was in Rome as part of a pilgrimage all seminarians at St. Vincent take in their third or fourth year of study.